I have a little challenge for you chefs/cooks out there – with Christmas approaching I’m struggling for some recipes for “nibbles” to prepare and freeze ahead. I’m sure you know the sort of things I mean – savoury pastry snacks etc. (the sort the supermarkets put on for 2 for £5 offers at this time of year!). I have to say we haven’t always used them up and towards the end of the festive season – when it’s just the two of us – we have a cozy evening on the sofa with just snacks and a bottle of fizz for company! 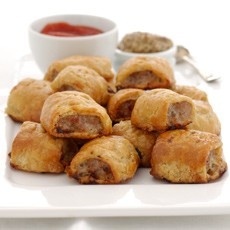 I’ve made Delia’s sausage rolls for longer than I care to remember, and the last few year’s Nigella’s sticky cocktail sausages always make an appearance but I’m particularly looking for cheesy and veggie freeze ahead treats. Would you be happy to share a recipe with me? I will fully credit it to you on my blog if you can. You can email me at realfoodfans@btinternet.com – look forward to hearing from you! with goats cheese, basil and tomatoe…little fiddly but worth it. I have also made pizza and cut in bite size and freeze. Thanks Viv some good ideas there! How about this for a bit of fun. I call it “Full English” – make some bite-size potato rostis (which you can do a couple of days in advance, just crisp up in the oven before using) spread thinly with some tomato sauce or HP, whichever you prefer, top with half a hard boiled quails egg and a little piece of crispy bacon. Great if you have over-indulged but still fancy breakfast!! Thanks Debbie – be a nice one for a brunch. I’m going to enjoy trying that out.